Architect, artist and instructor Stephanie Bower is well-known in the Urban Sketchers community for her sweeping watercolors of landmark architecture as well as more ordinary buildings. Lucky students here in the Pacific Northwest and Urban Sketchers symposium attendees have been illuminated by her “Good Bones” workshops that focus on architectural perspective. 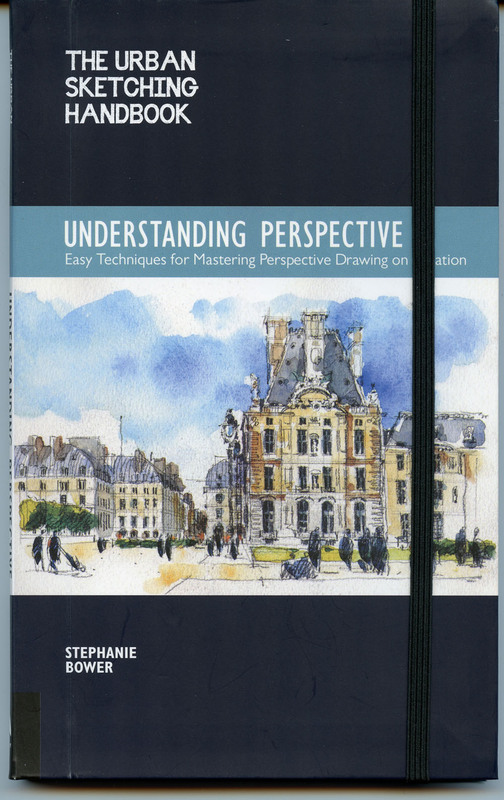 Now anyone can learn her methods from her new book, the latest in The Urban Sketching Handbook Series: Understanding Perspective: Easy Techniques for Mastering Perspective Drawing on Location. 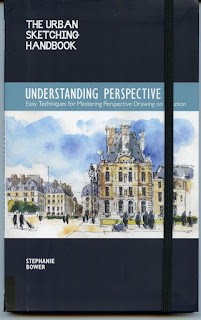 Beginning with basic terms and principles related to understanding perspective, the book moves on to its heart: analyzing a view’s potential levels (eye; bird’s eye or aerial; worm’s eye) and angles (one- and two-point perspective; multiple vanishing points). While beginning and intermediate sketchers might choose one-point, eye-level perspective, more advanced sketchers can use the same techniques to challenge themselves with a scene of multiple buildings, each rotated so that none is parallel to another. The how-to section breaks down perspectival drawing into layers – what Stephanie calls the Shape of the Face, the Shape of the Space and the Shape of the Box. Each step is fully illustrated to explain the concept. 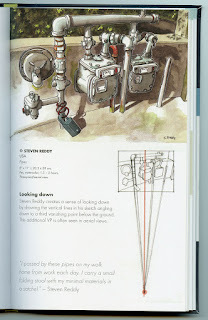 In addition, many sketches, either by Stephanie herself or other urban sketchers worldwide, are shown as examples of the concepts taught. In the final chapter, perspective challenges unique to architecture, such as arches and domes, are covered, as well as more general challenges like ellipses and reflections. drawn from a 3-point, aerial view. 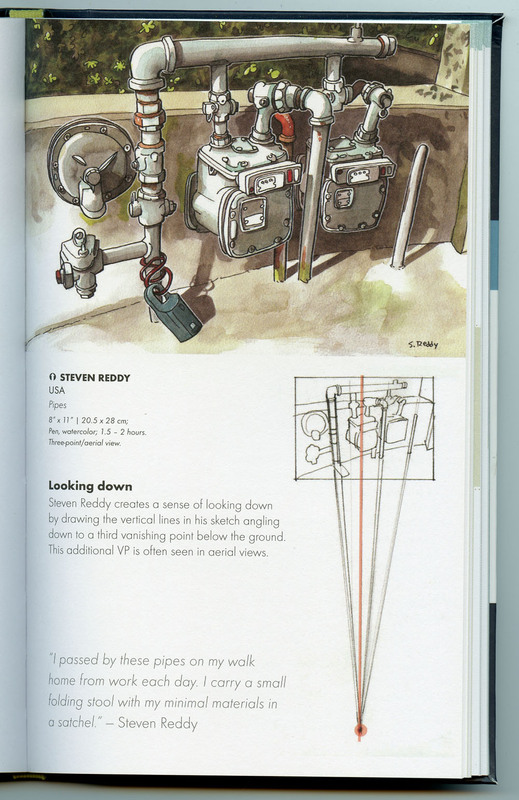 While the book is worth skimming for its beautiful location sketches (you’ll find many of your favorite urban sketchers here), those illustrations are not just eye candy. Unique among the many current books focusing on urban sketching, Stephanie’s book is full of sketches annotated with the artist’s view when the sketch was made as well as the number of perspective points. These notes are not limited to architecture. If you’re like me, you might think about perspective issues only when drawing architecture, but perspective principles apply to everything (even clouds! Stephanie points out), and these annotations are surprisingly helpful in driving that point home. For example, Steve Reddy’s sketch of some utility pipes was drawn from a three-point, aerial view (looking slightly down on the pipes from a seated position). An accompanying diagram shows how the lines in his sketch could be extended to a third vanishing point below ground. Urban sketchers of all levels can be inspired and challenged by this technique-rich volume. It’s a welcome addition to the Urban Sketching Handbook series.